In a month where turkeys are king, I’m still all about the chicken. Fortunately for this gal (who now dwells in the well-manicured land of sidewalks, postage-stamp-size yards, and a golf-course), my parents maintain a little farm and cabin with a couple dogs, a cat (remember Boo? ), honey bees and chickens. I credit their eggs for the deliciousness of many a baked good, and their meat birds have also made me a chicken-snob. My folks’ hard work and labor=our full freezer and savory suppers. 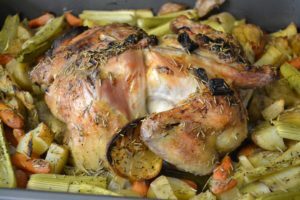 In case it isn’t just their birds that make for a great dinner, I’ve included the recipe that I use to roast organic cornish hens. Enjoy! My parents were coming to town, so it was only fitting we prepare one of their birds for supper. 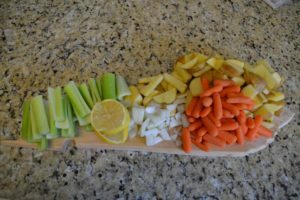 To begin meal prep for 4, I chopped and washed: a full head of celery, 10-12 yellow potatoes, 1 onion (plus halved another), and half a lemon. I saved a little time on using a full small bag of baby carrots. The next order of business is prepping the bird. Using the full cornish hen, I ran cool water over the entire bird for several minutes, patted dry with paper towels, and then stuffed a whole onion (which I had halved) into the cavity. During this step, I also carefully separate the skin from the bird by running my fingers in-between the two. Try not to rip the skin when you do this, because it is what holds in much of the moisture and flavor, but doing this step now saves you some grief later and allows for more seasoning (I stuff a few chopped onion pieces and some spices under the skin). 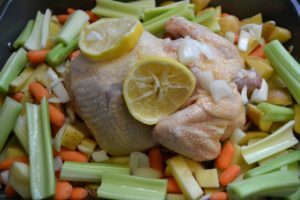 Next, I give the bird and pan a light coating of extra virgin olive oil to prevent adhering to the roasting pan, but also to aid in the spices sticking to the bird. 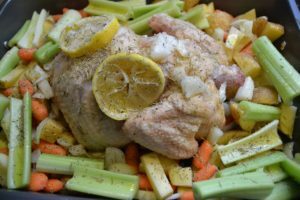 I filled the bottom of the pan and all around the bird with the sliced veggies and placed my lemon slices on top (give them a good squeeze onto the chicken prior to placing). Now for the extremely un-calculated part. I go to town with more EVOO, garlic salt, ground pepper, and rosemary. I cover everything very generously. Place in center of the oven on 375degrees for 2 hours uncovered. This is when I also bring out the bleach and clean my sink and Lysol-wipe practically every surface in my kitchen that may have been touched by raw chicken. Good, wholesome, healthy, organic roasted cornish hen and mixed veggies. Food for 4 and more. 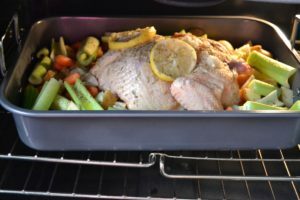 Need an idea for leftovers? Check out Chicken Doo! Preheat oven to 375 degrees Fahrenheit. Chop all vegetables except 1 onion and 1 lemon (slice lemon and half onion). Prep bird by washing for several minutes under cool water. Pat dry. Fill cavity with halved onion. Separate skin from meat and be careful not to tear skin. Lightly grease roasting pan. Place chicken in middle of pan, surround with chopped veggies. Drizzle generously with EVOO. Dust with rosemary, garlic salt, and ground pepper to taste. Bake uncovered for 2 hours. Serve warm.